2Face Idiba cautions Nigerians to keep the peace this election season. As a Naija American Girl, I don't feel qualified to campaign for or against any candidate in this Nigerian election season. really don't know who should be the next president of Nigeria, whether Buhari or Jonathan, but I do know that I want my family to live in peace and safety. I do know that I want quality of life to improve for every single Nigerian. What's it gonna take to make that happen? It's definitely an uphill task. But it starts with a change in heart and mindset of Nigeria's leaders and Nigeria's citizens. At the end of the day, I'm just praying for a peaceful election. No bombings. No violence. No unrest. Is that too much to ask in today's Nigeria? I believe not. 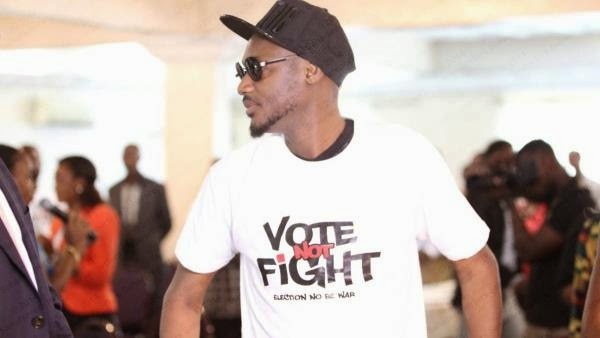 2Face Idibia put it very plainly in his brilliant new video Vote Not Fight.